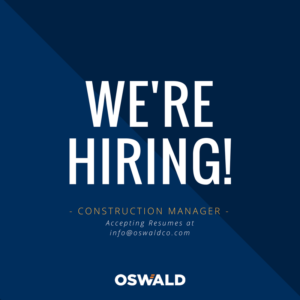 The Field Construction Manager is responsible for planning, directing and managing a construction project’s daily field operations. This person is an aggressive, take-charge leader who has a strong customer focus, a sense of urgency, skilled at building a cohesive construction team, a concern and respect for safety and the desire to achieve quality in the final product. Overall accountability for client project delivery from pre-construction through commissioning focused on achieving high quality, site safety, and aggressive schedules. Facilitate building a collaborative team on each project – ability to work with a diverse group of trade contractors to build and lead a cohesive team that can successfully execute a project by meeting, or ultimately exceeding, schedule, budget and quality. Client Interaction – confidence in working and communicating with client field level personnel on a daily basis. Ability to meet and drive project schedules by incorporating industry leading techniques such as Lean Construction and Last Planner. Willingness to travel outside of the Greater Cincinnati area to successfully execute a client’s project. Travel could be for extended periods of time depending on the location and schedule. Working knowledge/comfort level with technology solutions such as Microsoft Office, BIM, paperless environment, etc.